Cuba has approved a short series of cruises Oceania Cruises has scheduled from mid-November through the end of December aboard the 342-stateroom Insignia. While not copying what Fathom was doing, Oceania seems to be filling the void in the market for the longer cruise to the island that includes multiple Cuban ports. The complete story appeared in the February 17 edition of Cruise News Daily. Details of the stories appeared in the February 17 edition of Cruise News Daily. Norwegian Cruise Line ordered their first ships from Fincantieri today. Four ships were ordered with an option for two more, and the line said this new class will form the backbone of the future Norwegian fleet. Fincantieri scheduled delivery for 2022, 2023, 2024 and 2025. If the options are exercised, they would be delivered in 2026 and 2027. Details appeared in the February 16 edition of Cruise News Daily. 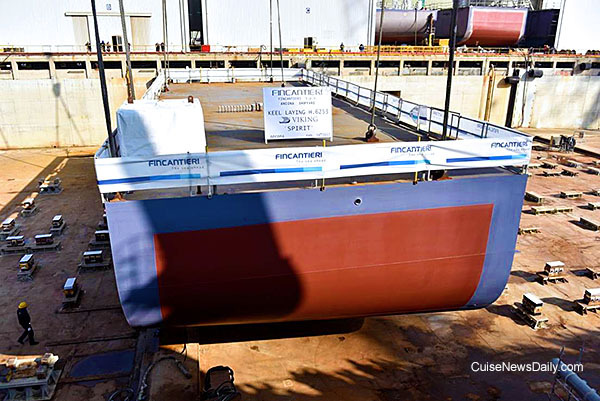 Viking Spirit began to take shape today when Fincantieri laid the first block of the keel at their Ancona yard. That block was 11 meters long, 28.2 meters wide and weighed about 280 tons. AIDA, Carnival's German brand, will name the next ship at Palma de Mallorca, one of its summer home ports, on June 30. Australians love seafood. A couple of weeks ago we told you how Carnival added seafood restaurants to the two ships they have based in Australia. Now word comes that sister line P&O Australia will be adding a seafood restaurant to Pacific Dawn (the former Regal Princess) when it goes into drydock later this week. Norwegian Star returned to service on Tuesday afternoon (local time) when the ship left Melbourne (Australia) after technicians completed repairs on both Azipod propulsion pods, which failed leaving the ship adrift last week off the coast of Melbourne. The ship is now scheduled to arrive at Auckland on February 18 at 9:30am (local time). As promised, Cunard will be taking the winner (and her people) of the Westminster Kennel Club Dog Show across the Atlantic aboard Queen Mary 2. Cunard is the only line to carry dogs and cats aboard their ships in a special dedicated kennel. Harmony of the Seas diver Cesilie Carlton is seen in the video below, shot by acrobat Sydney Brown, diving into the Aqua Theater pool 55 feet below. Video courtesy of Sydney Brown, via Instagram, shown under the standard Instagram license. All rights reserved. Carnival Cruise Line said today they have been approved to operate a dozen cruises to Cuba from Tampa beginning in June aboard Carnival Paradise. Havana will be the only Cuban port on the four- and five-night cruises. The cruises will run approximately every other week through October, except for one that unexplainedly sails next May. Monday morning, about 8:30am, when Carnival Elation docked in Nassau, a passenger notified the crew that she couldn't find her husband and last saw him about 2:30am. Crew members made a full search of the ship for the 24-year-old man from Georgia, but they did not find him. Just before 11am, officers searching the security camera footage did find images of him going overboard at approximately 2:45am from Deck 11. Royal Caribbean's Majesty of the Seas was delayed at Port Canaveral Monday night when it failed a US Coast Guard safety inspection. There were reportedly five items of lifesaving equipment that needed repair. The month-old Seabourn Encore broke its aft moorings Sunday afternoon (local time) while it was docked at Timaru (NZ). Sudden strong winds (up to 45 knots) then carried the ship's stern a couple hundred feet so that it allided with the cargo ship Milburn Carrier II and then came to rest against the wharf. There were no injuries on either vessel. Details appeared in the February 13 edition of Cruise News Daily. Cell phone video of the incident is below. Video courtesy of Corrina Worthington used under the standard YouTube license. All rights reserved. Following two weeks away from New Orleans, Carnival Dream has returned after a dry dock that created a number of new dining venues and bars aboard the 130,000-ton ship. One of the most notable is a new branch of Guy Fieri's Pig & Anchor Barbeque Smokehouse. It is just the third branch of the restaurant to open. The disabled Norwegian Star arrived at Melbourne Saturday afternoon (local time) under tow and is safely alongside the Station Pier. The ship lost propulsion when it was about 20 miles off the coast on Friday. Technicians have assessed the situation and have begun repairs. It was a busy day at the Meyer Turku shipyard in Turku (Finland). It was just as busy for TUI executives who were in town for the events concerning their next two ships. Meyer was laying the keel for Mein Schiff 1, and they were cutting the first steel for Mein Schiff 2.